ccept signal from alternator/ignition coil/magnetic pick up. With spike protection as per automotive standard norms. Cross coil moving magnet air core type. With hour meter analog type or digital type. - This is clock type revolution device to measure revolution per minute of engine, machine tools and motor, and moving velocity of belt conveyor with high accuracy. - This is complete machine type without battery and 3 kinds of terminal are equipped. This tachometer contains at revolution counter and a time clock in a single mechanrsm and r.p.m. or peripheral speed is automatically indicated, without requiring any special stopwatch, by 3 Seconds after the operation push button being pressed. Easy to use and excellence accuracy. 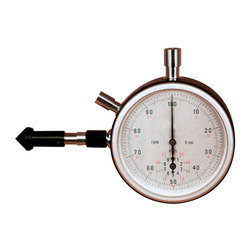 We are offering an extensive series of Analog Tachometer. These products are extremely employed in themarket for diverse purposes. 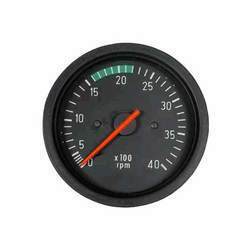 Galaxy Indicators India (p) Ltd.
We are involved in importing and supplying a wide range of tachometer. , these are precisely engineered using quality basic material and ensures accurate performance.